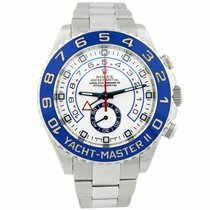 Rolex launched the Yacht-Master II in 2007 aiming to tighten the strong relationship with the nautical sport world. The Yacht-Master II is designed to meet the desires and needs of professional sailors. The Yacht-Master II is equipped with an innovative regatta chronograph, the first chronograph with programmable countdown with a mechanical memory, allowing yacht racers to be perfectly synchronize at the crucial start of any race. The Yacht-Master II 116680 is formed by a 44 mm steel case but what makes this model special it is its peculiar bezel. The Yacht-Master II 116680 bezel operates in conjunction with the regatta chronograph internal mechanism. As a mechanical component joint to the internal movement the bezel is the key of the programmable countdown of this watch. Yacht-Master II recognizable dial features a red-contoured countdown arrow and the second hand simple readable against the dedicated 10-minute countdown graduation. Yacht-Master II 116680 steel oyster bracelet resembles the elegance delivered by Rolex tradition combining comfortably and robusticity. Yacht-Master II 116680 is also water resistant up to 100 meters (330 feet) with a power reserve of approximately 72 hours.